The Nc is a middle-latency ERP component that is manifested as a negative deflection in the ERP that is maximal between 400 and 800 ms following the onset of a stimulus (see Figure 3.1 for an example of the morphology of this component). Generally, this waveform is quite robust, with a well-defined negative peak, and is present regardless of the familiarity, probability, or type of stimuli presented. It has maximal amplitude over fronto-central scalp regions. 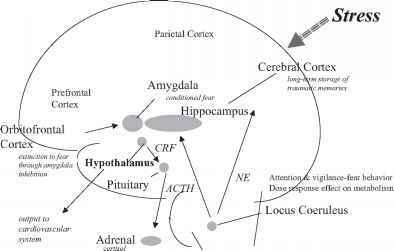 In a recent study utilizing dipole source modeling, the Nc was found to be localized to the anterior cingulate and other regions in the frontal cortex (Reynolds & Richards, 2005). This waveform has been observed in infants as young as 4 to 7 weeks old (e.g., Karrer & Monti, 1995) and persists as a prominent ERP wave feature through middle childhood. However, this waveform is generally not seen in adult ERPs. A variety of studies of the Nc in infants have provided seemingly contradictory results concerning its behavioral correlates. Some studies have shown Nc is of greater amplitude in response to unexpected or unrecognizable events and infrequently presented stimuli (e.g., Courchesne et al., 1981; Karrer & Ackles, 1987), while others have demonstrated greater-amplitude Nc in response to familiar stimuli (e.g., de Haan & Nelson, 1997, 1999; Nelson et al., 2000; Snyder, Webb, & Nelson, 2002; Webb & Nelson, 2001). In general, however, these inconsistent findings appear to be due to the degree of familiarity with the stimuli used to elicit the Nc waveform. Those studies showing greater Nc amplitude in response to infrequent (or rare) events have employed the conventional oddball paradigm, with infants having no prior exposure to any of the stimuli. However, the studies conducted by Nelson and colleagues showing greater Nc amplitude in response to familiar events (e.g., de Haan & Nelson, 1997) have utilized stimuli familiar to the infant prior to the experiment (e.g., the mother's face) that were quite dissimilar in appearance to the unfamiliar stimuli, and they presented the familiar and unfamiliar stimuli with equal frequency. The Nc waveform has been characterized as an obligatory or automatic attentional response (e.g., Courchesne et al., 1981; Karrer & Ackles, 1987; Nelson, 1994; Nelson & Collins, 1992; Nelson & Monk, 2001). Because it is the most robust of ERP components seen during infancy (it can often be observed on single trials and is manifested regardless of type or frequency of stimulus), the Nc waveform is largely considered to be automatic. However, despite its seeming automaticity, the amplitude of Nc does vary within individuals depending on the type and/or frequency of the eliciting stimuli. Consistent with typically observed developmental changes in ERP waveforms, the latency of the Nc peak primarily depends upon the age of the participant, with the peak, on average, occurring earlier in older children. For example, at 4 months, the Nc peak has been observed at around 700 to 800 ms post stimulus onset, with a fairly rapid decrease in latency to approximately 400 to 500 ms by 12 months of age. In addition to the expected normative decrease in peak latency, there appears to be a change in terms of what type of stimuli elicits the greater amplitude Nc from infancy to early childhood. Consistent with previous findings by Nelson and colleagues, Carver et al. (2003) demonstrated that children under 24 months of age demonstrated a larger Nc amplitude in response to a familiar face compared to an unfamiliar face. However, the reverse pattern was seen in children older than 45 months, with these older children exhibiting greater Nc amplitude in response to an unfamiliar face compared to a familiar face. It is unclear what the neurofunctional significance of this shift may be. The association of the Nc ERP component with memory per se is not clear, and it appears that this waveform may generally be more correlated with some fundamental neurobehavioral aspects of attention than memory. However, this waveform's responsivity to stimulus familiarity (e.g., Carver et al., 2003; de Haan & Nelson, 1997; Webb et al., 2005), in particular those stimuli to which infants have been pre-exposed (e.g., mother's face, favorite toy), may suggest that it could be associated with broader neural processes related to recognition memory (e.g., Reynolds & Richards, 2005). In the sense that familiarity with a stimulus may indirectly index memory, the neural processes underlying the generation of the Nc waveform may be of interest in ERP research on memory with children who have been maltreated. Also, examining the developmental aspects of this waveform and its behavioral correlates may also help inform questions of how the experience of child maltreatment may effect brain development generally. The N400 waveform is most typically considered to be a language-related ERP component, indexing violations of semantic expectancies (Luck, 2005). It is a negative-going wave that displays maximal amplitude over central and parietal electrode sites, with its neural generator believed to be located in the left temporal lobe (Luck, 2005). In addition, the N400 also has been linked to memory processing (Halgren & Smith, 1987; Rugg & Doyle, 1994). For example, in tasks where new and old stimuli are presented, the new stimuli elicit a greater-amplitude N400. Also, the amplitude of the N400 decreases with stimulus repetition, further indicating that this waveform is sensitive to familiarity (Rugg & Doyle, 1994). Thus, some ERP researchers (e.g., Halgren & Smith, 1987) have theorized that the N400 indexes the ease with which the currently viewed stimulus is integrated into the current context, with greater facility (i.e., integrating a repeated stimulus versus one that does not "fit" into the context of other stimuli) associated with lower-amplitude N400. There are no published reports concerning the developmental course of the N400. Nelson and Monk (2001) have speculated that the Nc observed in infants and toddlers may evolve into the N400 by age 4 or 5 years, but this idea remains untested. However, the N400 is another ERP component that could potentially be utilized to index some aspect of memory functioning in children who have experienced maltreatment, particularly in the context of examining the developmental course of the Nc.